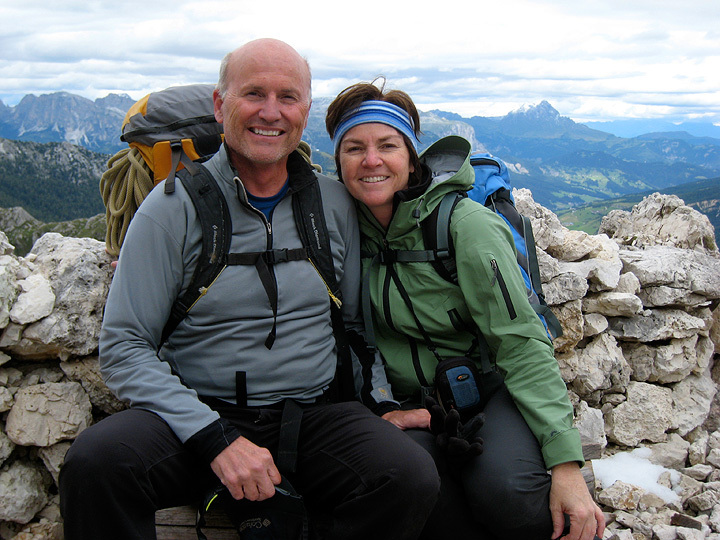 Michele and Craig, who have recently settled down near the shores of Lake Tahoe, joined Mark for six days in the Dolomites. 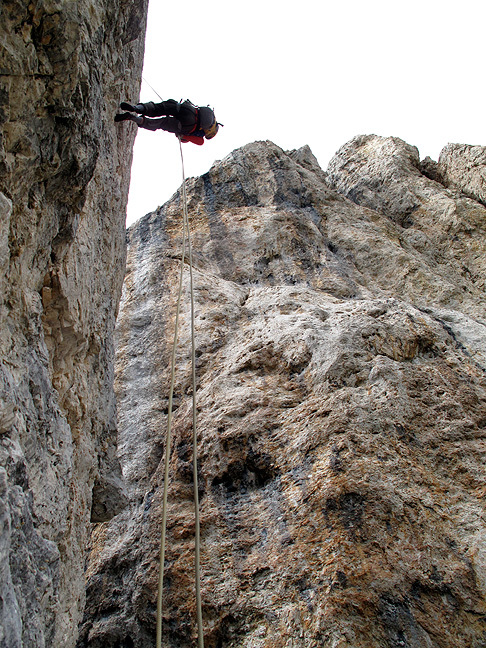 Though the weather was anything except perhaps cooperative, we still did manage to climb for all but one of those days. Admittedly, we were chased down a couple of our descents by rain showers, but even so, once dry and warm again, they didn't seem so bad. 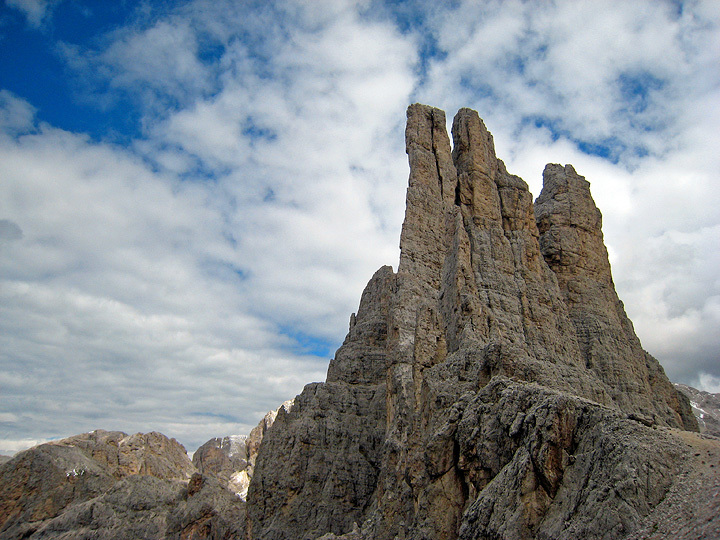 Our first climb was on the Torre Picolla di Falzarego. We did the classic and very popular South Ridge. Roll your mouse over the photo to see the route. 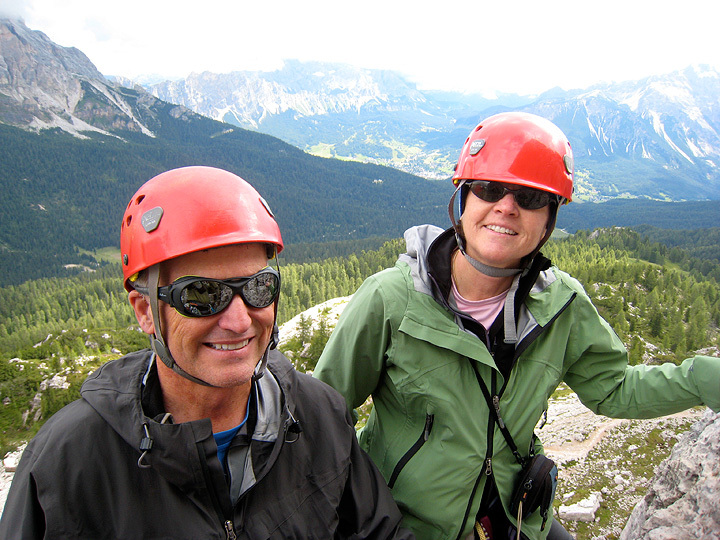 Craig and Michele on the South Ridge of the Torre. 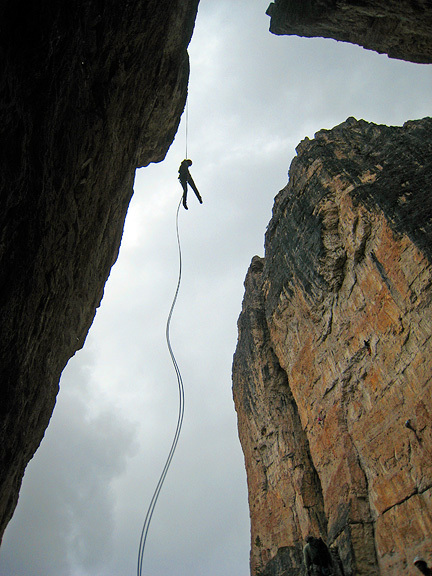 One of many steep rappel descents. 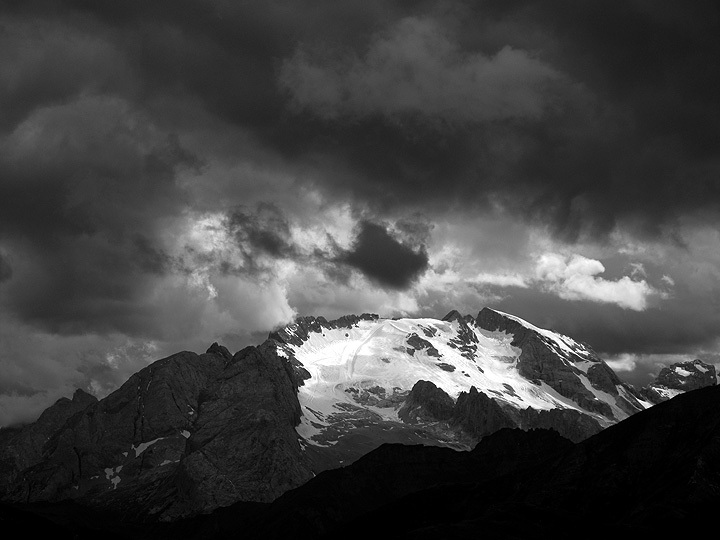 Looking back at the Marmolada under threatening skies. 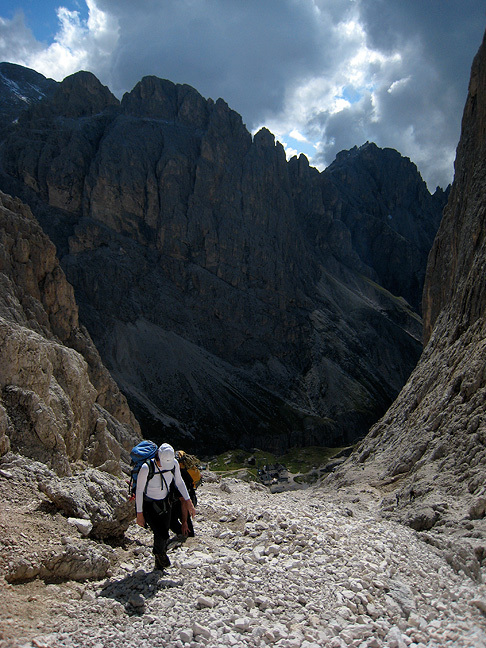 Looking back towards the Gran Vernel from Canazei. The new snow is a rare sight in July! On our days two and three, the weather was rather nasty. 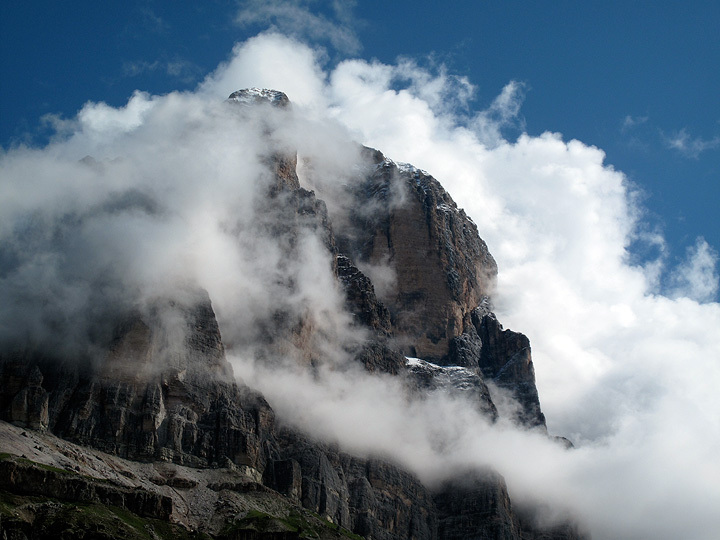 We did manage a climb on the first of the two, an easy but enjoyable route on the First Sella Tower, but were hustled down the descent route by a downpour. 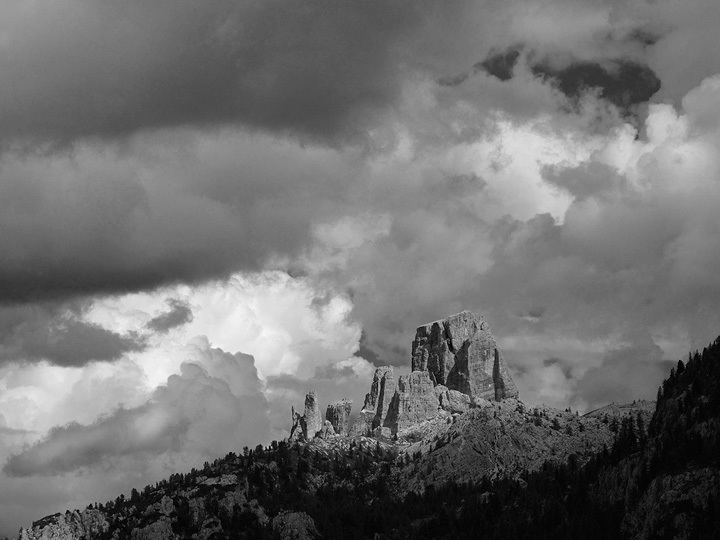 On our third day, truly nasty weather forced a break from climbing. A tour of Bolzano and a visit to the museum dedicated to the 5000-year-old Ice Man (Ötzi) offered some interesting distraction. 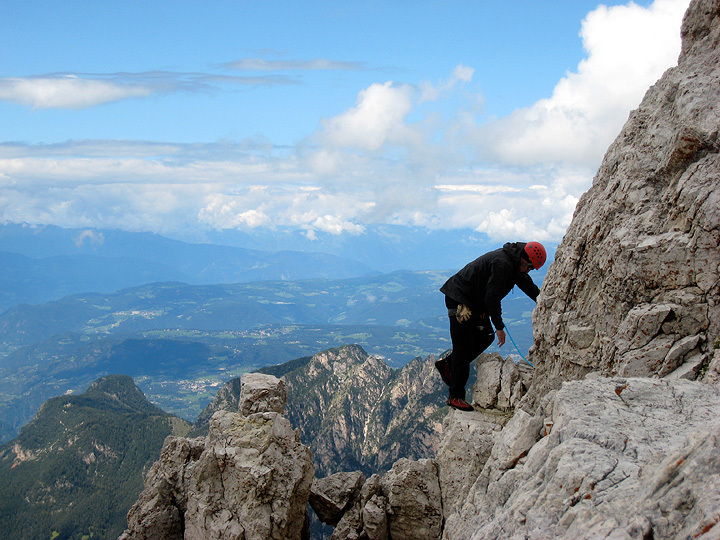 On our day four we climbed the South Ridge of the Hexenstein, shown here. Mouse over to see the route. Craig, high on the Hexenstein. 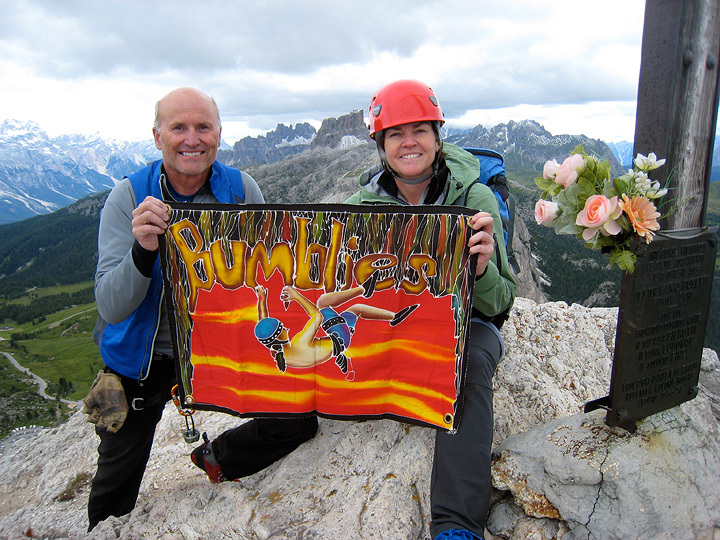 And the Bumblies Banner on the summit. 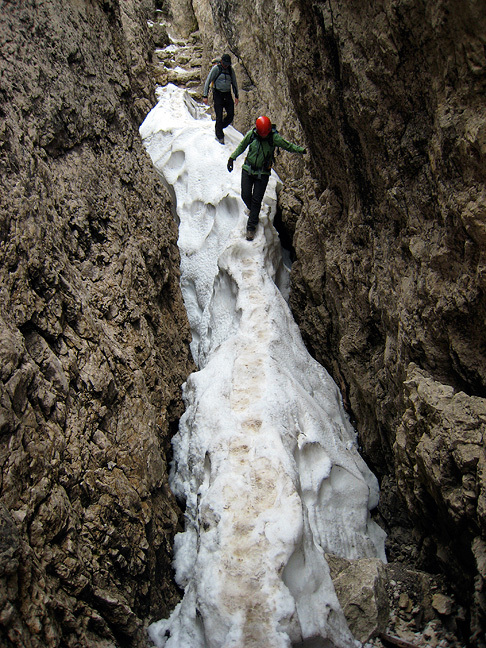 The descent was a mixed affair, trails, snow, ladders and World War One trenches. 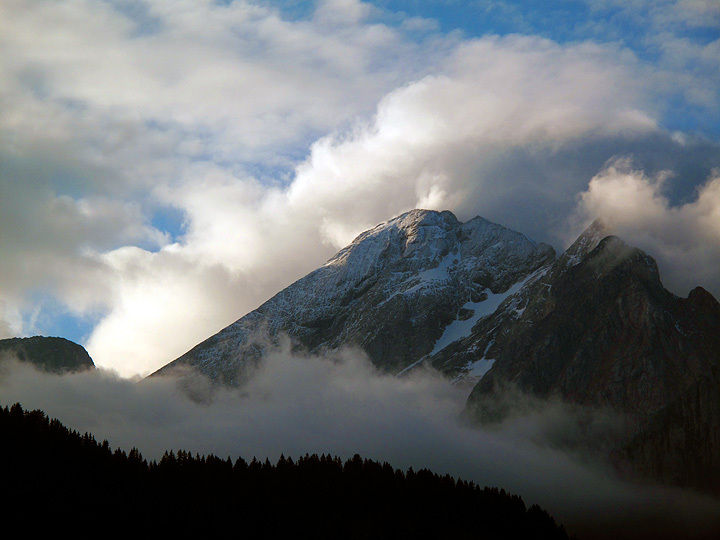 The weather forecast for our fifth day was the best of the week. 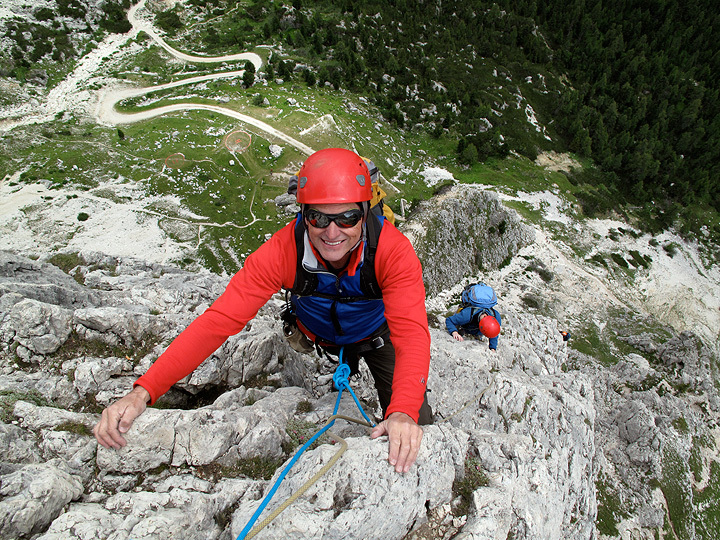 We took advantage of it and climbed the ultra-classic Delagokante in the Vajolet Towers. Mouse over the see the outrageous line. It is a bit of a walk to the base of the climb, but very scenic. 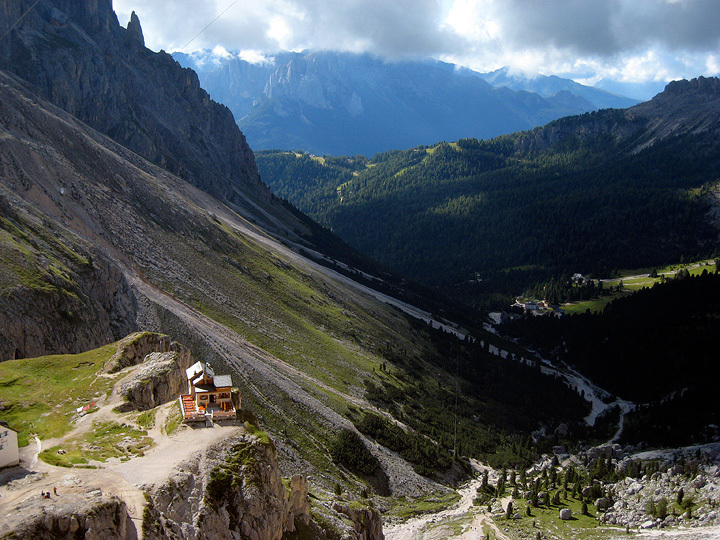 Here, we are looking down on the Rifugio Preuss and the Val Gardeccia. Finally, on the climb. 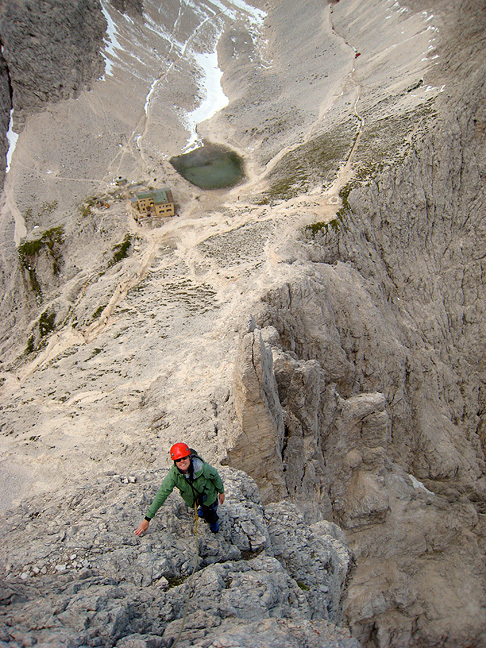 The Rifugio Alberto below. Craig, higher on the route, almost to the summit. We were lucky enough to be the first on the route that morning, enjoying a bit of solitude on what is often a very busy climb. Again, with a dubious weather forecast, we opted for something not too committing. 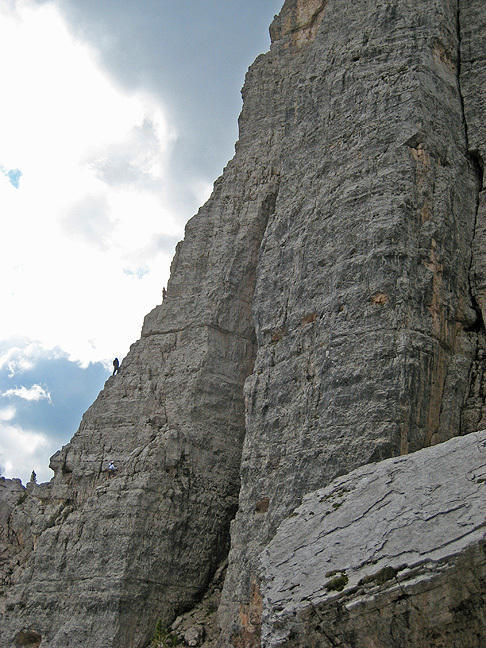 Climbing in the Cinque Torri seemed just right. 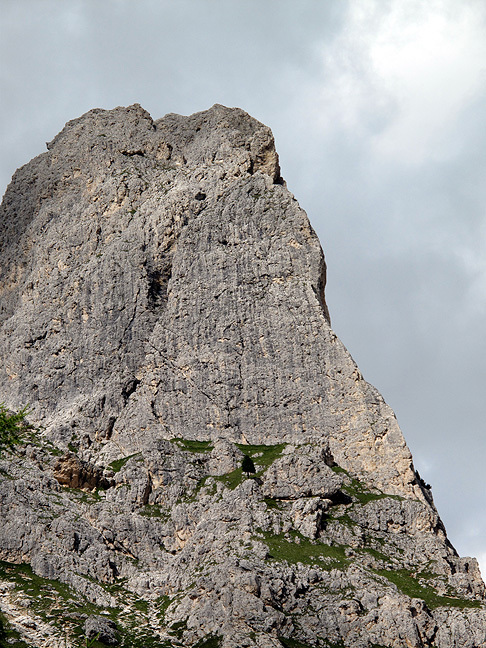 We started with the North Face of Torre Lusy, a fun, not too difficult route on great rock. Mouse over to see the line. 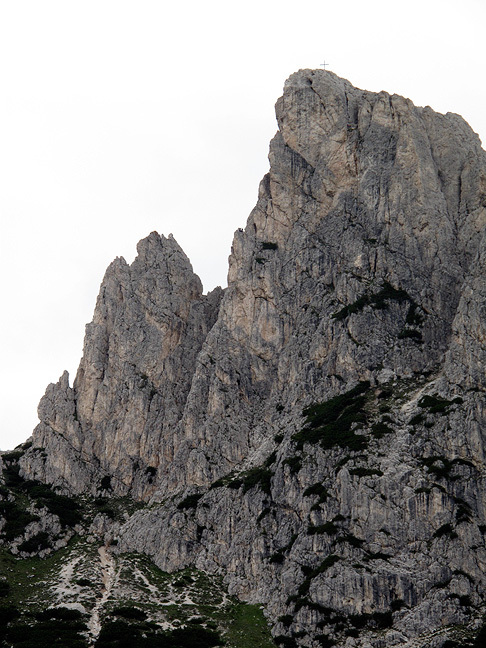 Looking across the valley at the Tofana di Rozes from the Cinque Torri. 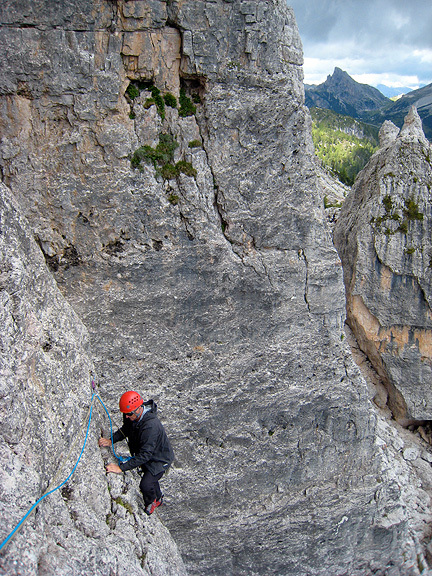 About four pitches up Torre Lusy. Craig an Michele on the summit. 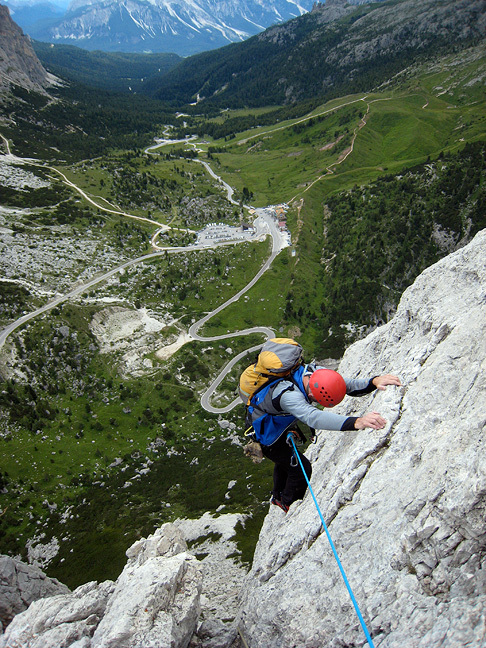 And one more outrageous rappel. Unfortunately, the rain began in earnest and were had to content ourselves with a short walk before heading down.